Dr. Sinda recommends the highest quality and potency of nutritional supplements to best support your health. There are many choices in the dietary supplement and vitamin market. At our clinic, we offer a variety of nutritional products from the nutritional providers Dr. Sinda has selected. Products can be picked up, ordered by phone (952)922-2345 or ordered via email. In addition NutriDyn and Metagenic products can be ordered directly from the distributor. A 10% discount will be applied to all products ordered from the website. Products will be shipped immediately and directly to your home. Once you are registered you can place orders for the supplements you need. In addition you have access to order any products they carry. Life expectancy increased by 5 years between 2000 and 2015, the fastest increase since the 1960s. With this being said, we can expect to live a substantial part of our lives in a state of hormonal deficiency. 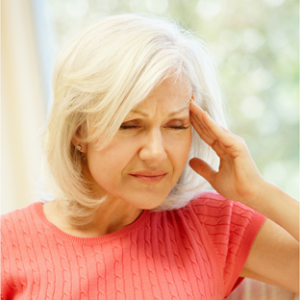 Hormonal decline and imbalance during the states of menopause and andropause are associated with experiencing mildly annoying to completely debilitating symptoms as well as an increase in diseases such as heart disease. Effects of insufficient hormones include bone loss, cognitive decline, loss of muscle mass, thinning of skin and much more. Without hormones, we cannot live. 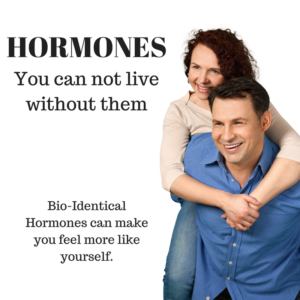 So why is there often so much confusion about bio-identical hormone therapy? We experience misunderstanding often between our patients and their family physicians. Exogenous chemicals (drug hormones; i.e.  Provera, Medroxyprogesterone, Premarin, etc. ), different from the actual hormone they are meant to replace, are used interchangeably in clinical practice, the popular press, and inprestigious medical journals, producing much of the controversy that surrounds hormone replacement. Billions of dollars can purchase a lot of advertising to sway the public and manipulate sponsors for physician educational events. The article “Point Counterpoint bioidentical hormones” published in the Journal of American Physicians and Surgeons speaks well to answer why there is so much confusion around human hormone therapy. It is also a great reference article available for you to print out and bring in to your family doctor. It is a priority for us to help you get started on the road to *feeling better* with bioidentical hormones. Through knowledge, support and education about bio-identicals, you will be empowered to get the natural treatment you are looking for to eliminate the difficult symptoms of PMS, peri-menopause, menopause, postmenopause and andropause. Schedule your follow up appointment or new patient appointment with Dr. Sinda today. There are many benefits of having a healthy body composition. Body Fat % – Fat % is amount of body fat as a proportion of body weight. Fat Mass – Total weight of fat mass in the body. Fat Free Mass (FFM) – Fat Free Mass is comprised of muscle, bone, tissue, water and all other fat free mass in the body. Water Mass – The amount of water retained by the body. Water plays a vital role in many of the body’s processes and is found in every cell, tissue and organ. Maintaining a healthy total body water percentage will ensure the body functions efficiently. It is important to look for long-term changes in total body water percentage and maintain a consistent, healthy total body water percentage. 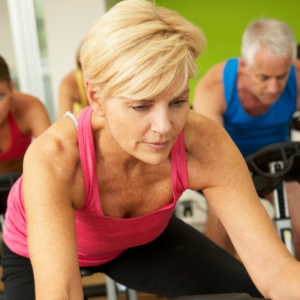 Average ranges for healthy adults are: Female 45 – 60%; Male 50 – 65%. Basal Metabolic Rate (BMR) – The minimum level of energy (i.e. calories) your body needs when at rest to function effectively including your respiratory and circulatory organs, neural system, liver, kidneys and other organs. About 70% of calories consumed every day are used for your basal metabolism. Having a higher basal metabolism will increase the number of calories used and help to decrease the amount of body fat. A low basal metabolic rate will make it harder to lose body fat and overall weight. BMR is the first step in getting an idea of how much fuel you need to keep your engine roaring all day long – It is the minimum number of calories you should eat on a daily basis. Body Mass Index (BMI) – BMI can be used to indicate if you are overweight, obese, underweight or normal. A healthy BMI score is between 18.5 and 25.Use this Online BMI calculator. How can a machine measure all of this Information? The machine is able to get this information by measuring bioelectrical impedance in the body. Fat within the body allows almost no electricity to pass through, while electricity passes rather easily though water, much of which is found in muscles. The degree of difficulty with which electricity passes through a substance is known as the electrical resistance, and the percentage of fat and other body constituents can be inferred from measurements of this resistance. Remember — when it comes to health, every little bit counts, and even a modest weight loss of 5 to 10% of your body weight significantly lowers your obesity-related disease risk. If you’re not sure where to begin, consult nutrition and fitness professionals for help with your diet and exercise regimens. We would be happy to recheck your body composition at any time, stop in or call to set up an appointment with our Nurse to monitor your progress. Did you know that a main cause of hormone-related health problems in women is not due to the deficiency of estrogen or progesterone but rather the ratio of estrogen to progesterone? BioIdentical Hormone replacement therapy with estrogen alone without an opposing progesterone should be avoided. It is important to have both your estrogen and progesterone levels tested at the same time. If you are interested in exploring your options to decrease estrogen dominance or would like a second opinion if you are being treated with only estrogen, contact our clinic to set up a consultation with Dr. Sinda. Dr. Sinda and our staff recommends quality products from professional supplement and skincare companies who share the same commitment to your health – optimizing your health and skin. The medical grade products we offer meet rigid testing standards to ensure scientifically-backed ingredients at clinically appropriate dosages. 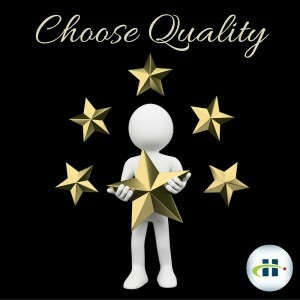 We trust these companies because they are accountable for the results we get with our patients. What can go wrong when you buy supplements online? 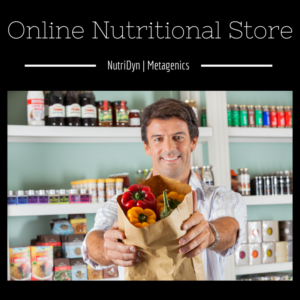 Many of our patients often take our supplement recommendations and turn to internet sites for convenience of online shopping. While we understand the desire to save time and money, there are some risks that patients are often unaware of when purchasing supplements online. Please read further. Please be sure you are purchasing from reliable sources. For your convenience, we offer shipping on all supplements and skincare products. We also can make arrangements for pick up if you can’t get here during office hours. If you are running low, feel free to email, call (952)922-2345 or use this form.